Persea Books. 2012. 84 pages. 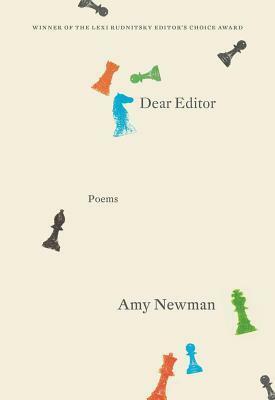 Amy Newman’s latest collection, Dear Editor (Persea Books, 2011), is as funny as it is poignant. Told in three ‘seasons’ of prose poems, almost every poem begins “Dear Editor: Please consider the enclosed poems for publication.” We never get to read the poems from the manuscript X=Pawn Capture—a mathematical and mysterious title—to which the letters allude, and Newman plays at piquing our interest just enough to keep reading on. Using the lingo that contemporary writers know by heart, Newman weaves the story of her grandparents’ shaky marriage, her introverted childhood and the desire for publication into an unlikely narrative about chess and sainthood. All of the prose poems can ultimately be summed up as an address to some type of void, or lack: in her work, in her family relationships, and within herself. A pervasive motif in the collection is the relationship of the speaker with her grandfather, or rather, the lack of such a familial relationship. From the second poem in the collection, dated 5 October: “My grandfather warned me about a lot of mistakes, and I made them anyway. The horse might not have been at the window, but when I think of her there, I think of something inexpressible.” The speaker acknowledges that “chess may be a metaphor . . . as the absence of my grandfather’s desire” (“19 November”), and in each of the letters, we get a glimpse of the grandfather as a solitary figure seemingly obsessed with chess and unable to connect with the women in his life—the speaker and her grandmother. “But my grandfather tells me that a girl pawn would be run out of town on a rail because she would be nothing but trouble . . .” (“15 December”). The figure of the grandmother is just as central to the discussion of chess as the figure of the grandfather; only she “didn’t like this game” (“3 October”). According to the prose poem dated 2 November, “X=Pawn Capture [is] an in-depth study of something I pretend to lyricize: my grandfather’s love for chess and how it ruined my grandmother’s afternoons and evenings.” Instead of chess, the speaker tells us, sainthood was the grandmother’s obsession, and together the two grandparents seem to stand as diametrically opposed pawn pieces. The collection retells again and again the same story, giving us small details here and there that lead one to the conclusion that life in this household was less than ideal. And the grandmother, in opposition to the grandfather, is shown “reading her calendar of saints, and brought in the platter of cabbages, along with her teary eyes. But I am saying too much” (“18 January”). The speaker emphasizes repeatedly that this is just a version of a story, not the story (as if there could ever be such a thing), and she makes explicit that what she is trying to tell us is in fact untellable: “the evening became something more than what letters arranged to make sound blocks can achieve” (“21 March”) and “the light that tells me how much language lets me down, the light for which every single adjective fails, fails, fails. I am still trying” (“5 April”). The speaker keeps trying—and failing—as perhaps a metaphor for the act of writing and publishing itself, a kind of ars poetica turned on its head. In certain moments—and usually as a way of concluding the prose poem, the speaker becomes self-aware of her writing. These meta-moments are both hilarious and sad, especially for writers who recognize their own desire for assurance through publication. Nearly every poem concludes “Thank you for your consideration, and for reading. I have enclosed an SASE, and look forward to hearing from you.” Perhaps less funny for non-writers, these prosaic lines in the middle of a poem are so real, so 21st century-post-post-modern that we can only laugh at them as a reflection of our own insecurities. (Especially for those of us involved in graduate programs: “but the workshop said: avoid myth at all costs because it’s too cliché” (“5 October”)). Newman seems to want to capture something that cannot be captured, and notes that the writing enterprise is a failed attempt to do just that, a reduction “to dry ink in a single file of letters” (“2 January”) of all that exists in this world. Sometimes crossing the border into the very prosaic, the poems in Dear Editor continually surprise with sporadic, beautifully lyric moments mingled with the prose. Most often, such moments occur when the speaker reflects on her own childhood, the void that exists within herself: “Isolation rang in my abdomen like a sliver of ash in an eye” (“10 October”) and “I am a lone body with an open door that needs to be guarded” (“23 March”). Newman’s version of the world, the act of writing, the self, is one not to be missed. It is a collection especially for writers but not only so. Truly unique, the collection can be likened to “this reverie of paradise we must trudge through, the pie tin littered with wan fruit skin parings and the leftover crumbs of flesh. Your move” (“17 March”).